Just lay back, relax, get high and smoke a stick! 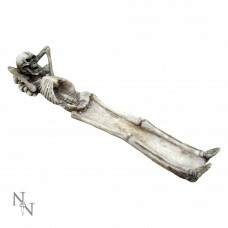 This awesome skeleton incense burner is perfect for anyone who needs a new incense burner. Cast in the highest quality resin this piece makes a perfect addition to anyone's collection! Note: Candle and Incense not included. A part of Nemesis Now’s Premium gothic and fantasy giftware collection, this alternative incense hol..